This past week was my first experience living outside of the United States and my first week as a student in India. During this time, our academic program has resided in Madras Christian College, explored the surrounding town of Tambaram, and traveled to the coastal city of Chennai while studying various subjects including urban life in India. My daily experience with the Indian roadway differed significantly from what I’ve experienced in the United States. 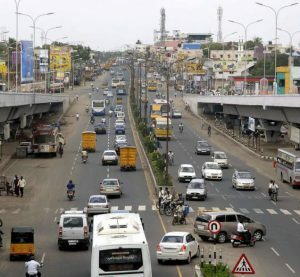 Traffic rules have developed differently in India in a way that accommodates the large population well, there are various types of transportation that are utilized more commonly here, and the relationship between pedestrians and motorists is somewhat inverted from the American system. One of the biggest anxieties and excitements of the past week has been traveling on the roadway and navigating Indian traffic as a foreigner. At first sight, traffic seemed completely chaotic, dangerous, and without order. I do not know whether it is more dangerous than American traffic, but after spending some time traversing it, I’ve noticed that there is some order to the madness. Although there are no strict traffic lanes or curbs, and people liberally run red lights, crashes are rare and people generally stay on the roadway. Traffic in India is more of a large river than a collection of discrete traffic lanes, where everybody follows the flow of traffic and is comfortable getting close to other vehicles, rather than the strict, boxed-in rules that we conform to in America. 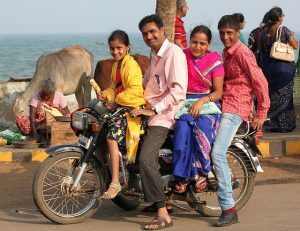 Many people in India use motorcycles or scooters rather than cars to get around. This differs greatly from America where most people have cars rather than motorcycles. Having the ability to own a car is a privilege many Americans have which is not possible for many Indians, as it is not economic to buy and maintain as an individual. A motorcycle is much cheaper, agile, and less bulky than a car. I’ll see rows and rows of motorcycles at the train station in Tambaram, compared to parking lots full of cars at the Charlotte airport. 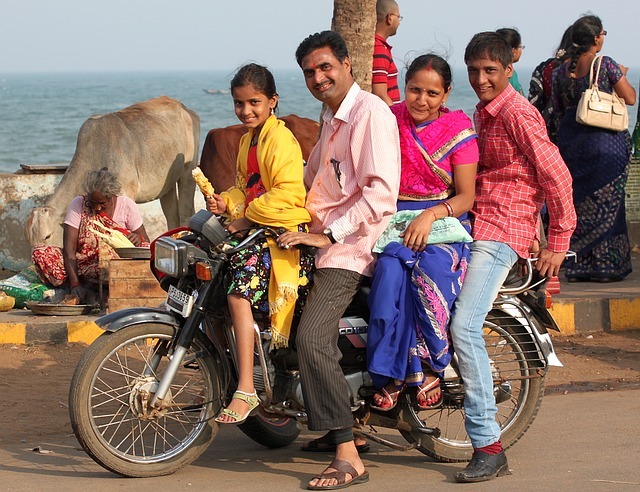 When we take an autorickshaw (the three-wheeled taxi of India) anywhere the drivers weave in and out of cars, while motorcycles weave in and out of autorickshaws because they are even more agile and compact. It is more time efficient and space-efficient to have many smaller vehicles because there is no way traffic would flow if everybody owned a car like we do in America. There are too many people! Finally, the pedestrian-motorist relationship is included in the river metaphor with people (and commonly animals) walking along the edges of the riverbank, sometimes wading into traffic. Since traffic is fluid, motorists drive around them, but not without honking their horns to alert others of their presence. You better not be sensitive to noise because motorists use horns constantly to warn other motorists and pedestrians not to swerve or turn because they are nearby. This is most common in turns or when coming close to pedestrians/bikers on the shoulder of the roadway. My first experience with an autorickshaw in Chennai was intense, as Chennai is a bustling city of 8 million people and lots of traffic, but I didn’t feel unsafe because everybody understands the flow of traffic and how to fit into the stream. Getting onto the roadway is still daunting to me since that experience in Chennai, but once I get into the flow of traffic I feel comfortable again. Compared to the US, the rules of the road are vastly different in India. Thus, the roadway and motorists in India have developed to accommodate the high population density in a space-saving, efficient way. 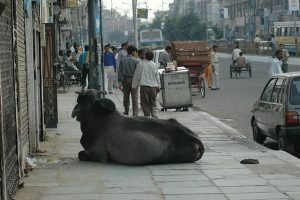 Although the Indian roadway seems chaotic, there is no way an American style roadway would get people where they need to go in time.